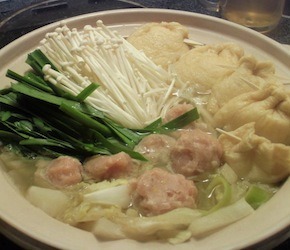 “Onabe” refers to a variety of Japanese broth based dishes which are usually consumed at dinner time during the colder months of the year. This soup dish is traditionally cooked in one big pot made of cast iron or clay in order to retain and evenly distribute heat. It is typically served on a portable gas stove situated in the middle of the table and is considered one of the most social ways of eating in Japan since everyone shares and digs into the food from one big pot. 1. To prepare the dashi (broth), fill your pot with water and add the kombu sheet to soften it. Let sit for about 4 hours or overnight. Once softened, cut a few slits into the seaweed sheets and heat on medium heat until the water begins to simmer. Remove kombu and add bonito flakes to simmer for approximately 5 minutes and then remove. 2. Add sake (if you wish), burdock root and daikon and simmer for 15 mins. 3. Now you can add Napa cabbage, leeks, tofu and mushrooms. Put lid on and simmer for another 10-15 minutes.